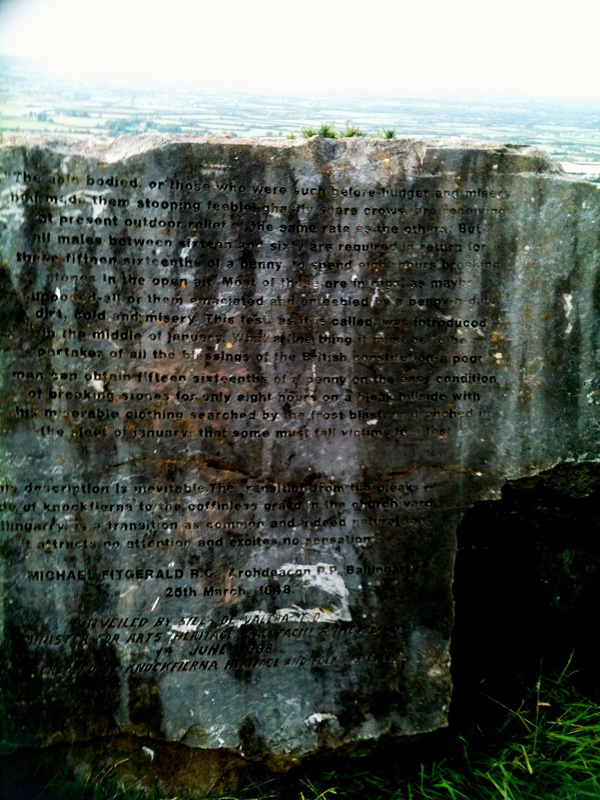 Sunday August 26th was the last day of Heritage Week in Ireland and on this day I chose to visit a Famine Settlement high above the Limerick landscape on Knockfierna, County Limerick. This hill was once home to hundreds of people. 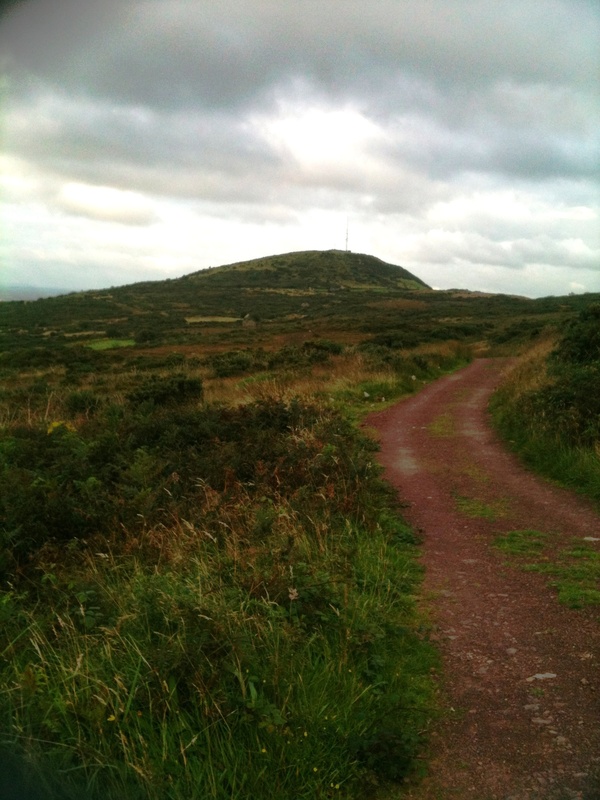 Knockfierna, the highest point in County Limerick at approximately 950 feet, was common land so anyone could live there. It was to this place that many of the dispossessed went to live during the Famine years . Some had been evicted because they could not pay their rent; most had no place else to go because there was no work. 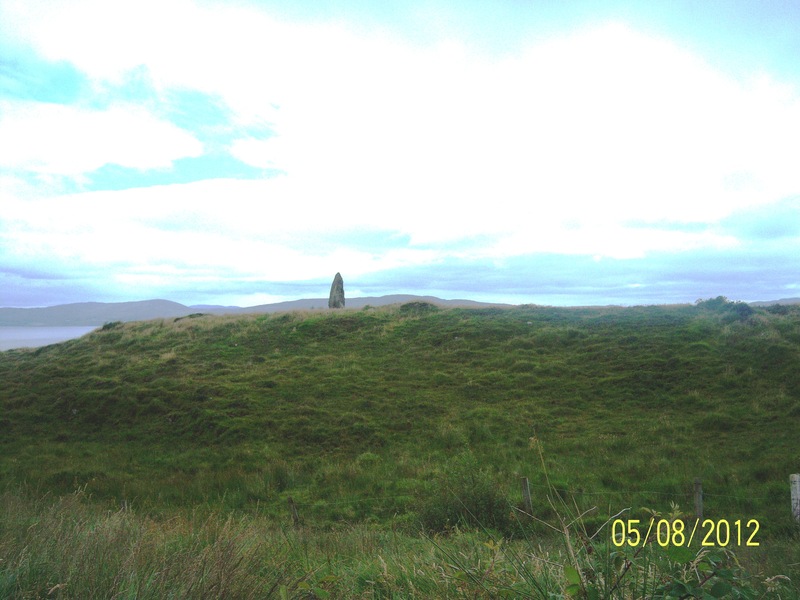 Foundations of scores of primitive shacks have remained in place on Knockfierna since it was deserted in 1847. Spread over some 200 acres, there are remnants of many houses – tiny, at about 8 feet by 8 feet, – with nothing more than walls and clay floors with sod roofs . It is estimated that about 130 families lived here at one time. These houses are now being preserved in memory of those who died in that terrible time. I found it quite difficult to think about many human beings, old people, younger people, children, huddled , sick and starving to death within these walls. Outside the remains of their huts, although it is now rather overgrown with scrub, it is still possible to see their horticultural efforts – raised beds where they tried in vain to grow a potato crop to feed their families ; a crop that rotted in the ground for several years as it succumbed to a blight. As potatoes were the mainstay of their diet, there was no alternative , and so they had nothing to eat. The great green lush pastures of the Golden Vale are below where these wretched people ‘lived’. It was to Ballingarry graveyard that their coffinless bodies were transported. 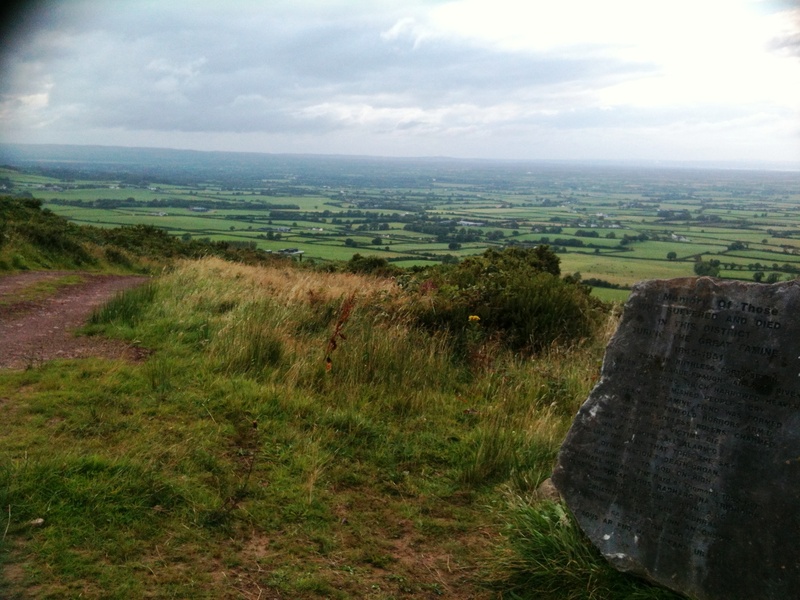 From this hill their emaciated bodies were taken to Ballingarry to be deposited into anonymous pits . up to God on high. The right side of the memorial is rather difficult to read and I will post a transcription here when I can find one! It is interesting to note the very lush green fields that can be seen over the top of this image – the great so called Golden Vale below is one of the lushest agricultural areas in Ireland , yet these unfortunate people starved to death in sight of it . 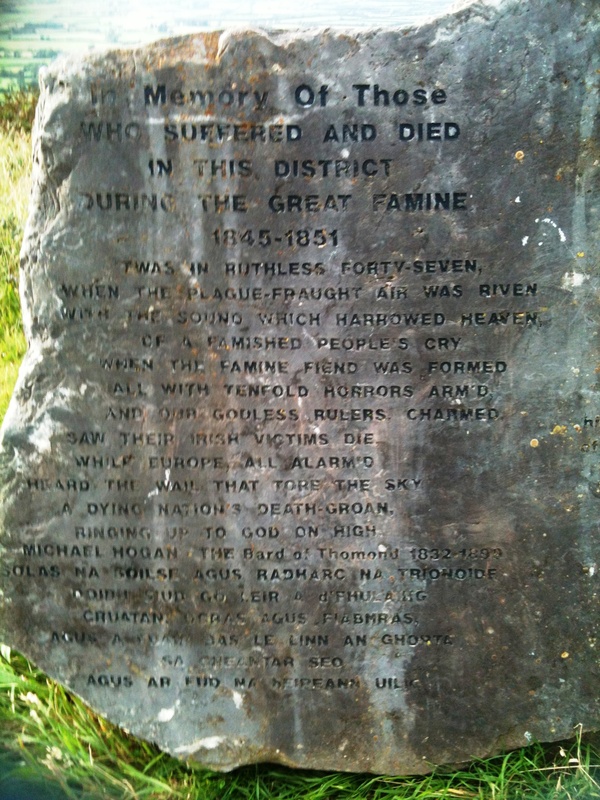 Over a million people died as a result of the Great Famine between 1845 and 1849. 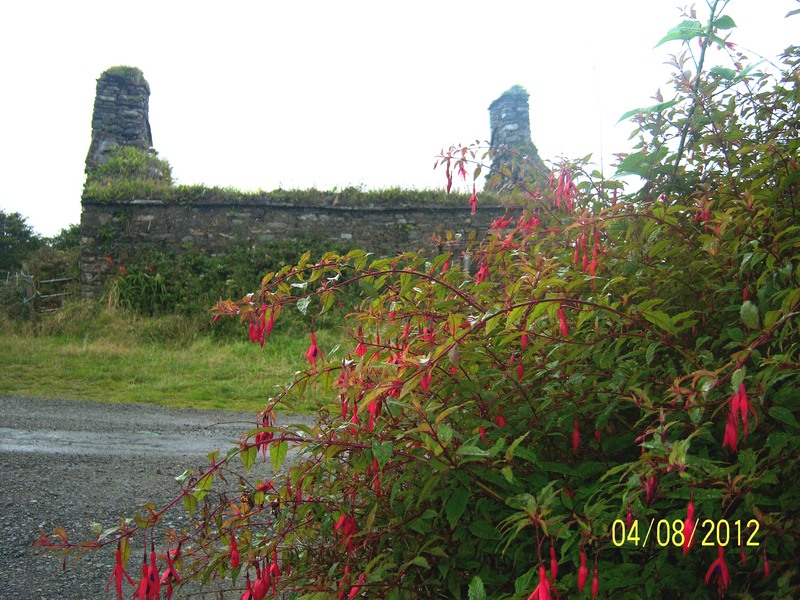 It is not known how many people who lived on Knockfierna died. This hill however preserves their hovels and the relics of their garden plots. On this hill they starved, on this hill they sickened and on this hill they died. Men, women, children. They are buried in anonymous pits in the lush fields of Ballingarry. Credit to Knockfierna Heritage & Folklore Group for recognizing the importance of this heritage site and to Pat O’Donovan whose passion for this project has become legendary. On Monday August 6th, I left the memorable Bere Island, County Cork to make the three and half hour drive home back to Limerick. The cloudy day was clearing up nicely and I decided to take the ‘scenic’ route home along the beautiful Beara Peninsula. And what a great decision that was! I spent many hours discovering beautiful places, enjoying fantastic scenery, and happening on wonderful surprises. Serendipity at its best! 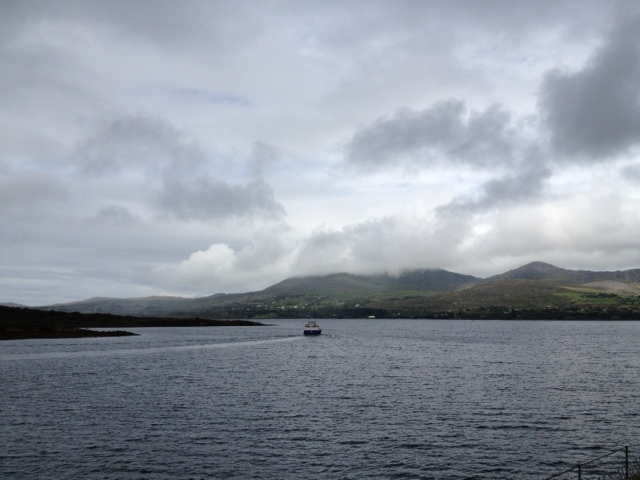 I headed west from Castletownbearhaven, County Cork, and began the ascent of the Slieve Miskish Mountains I took a last look back at the deep natural harbour of Bantry Bay. The tip of Bere Island is in the middle distance to the right, and the cloud-capped mountain to the left is Hungry Hill, highest of the Caha Mountains. (The novelist Daphne Du Maurier borrowed the name, Hungry Hill, for one of her very successful novels, later a film, set in this area). Travelling on, astonishing views tempted but as the road was narrow and twisting it was not safe to stop the car to capture a scene. A fabulous Martello Tower appeared and then disappeared on the twists and turns of the road. 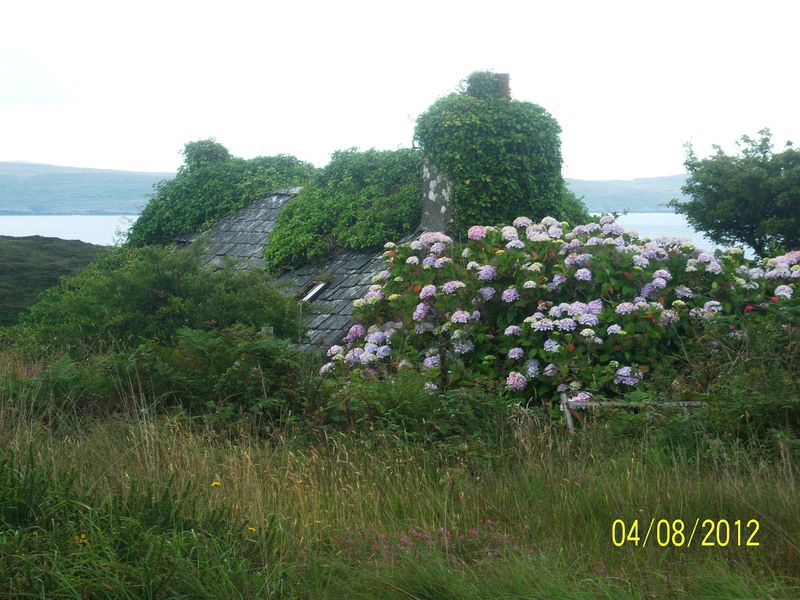 Likewise, a beautiful arrangement of flowers outside a stone cottage, swept past – as did many fabulous seascapes. This is no place for a lone driver with a camera taking snaps! This is Ballydonegan Bay with Allihies tucked in under the Slieve Miskish Mountains behind. Allihies is reputedly the furthest village in Ireland from Ireland’s capital city, Dublin. 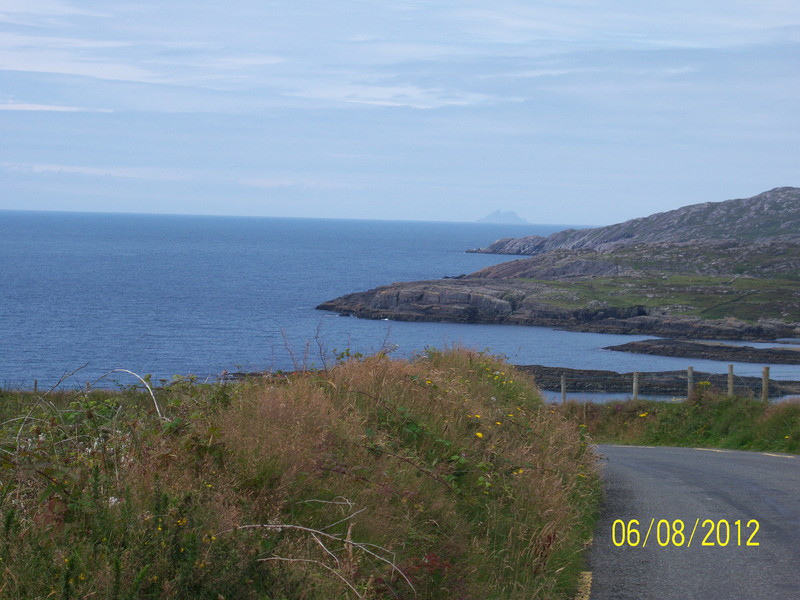 The mountains of the Ring of Kerry in the far distance on the approach to Allihies. 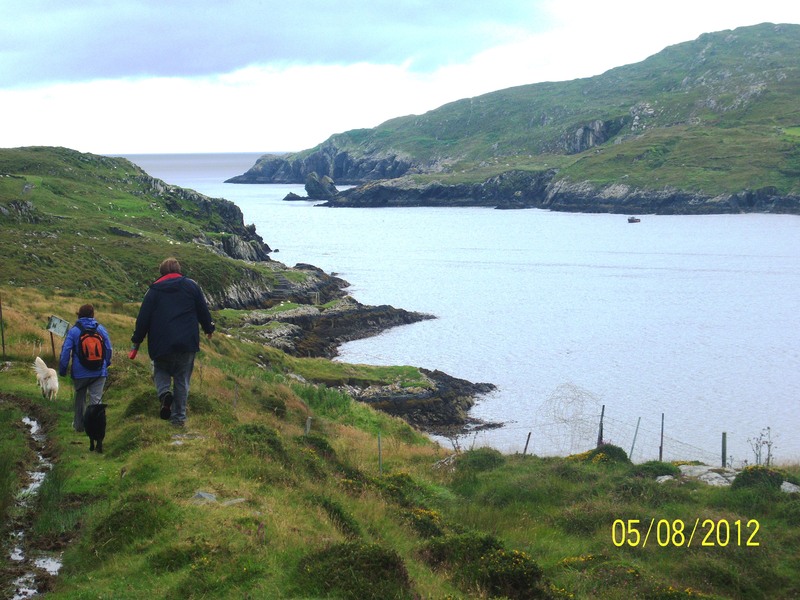 The Beara Peninsula lies south of the magnificent and world famous Ring of Kerry and all along the route there are magnificent views of the peaks of the Kerry Mountains. At a welcome stopping and viewing area I met a black Kerry cow, grazing peacefully in the field below the road. 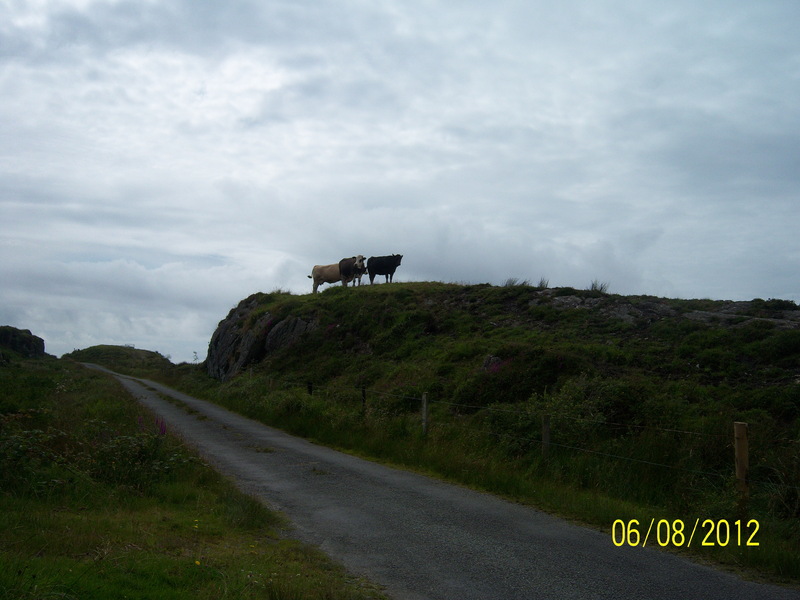 Kerry cows are a native Irish breed, now relatively rare and probably the oldest breed of cattle in Europe. The road winds down into Allihies. The coffee shop in the Allihies Museum is not to be missed! It is housed in an old Methodist Church, erected to accommodate the Cornish miners who came to live in this area in the 19th Century. These people had traveled from Cornwall in the south-west of England to bring their mining ability to the Copper mines of Allihies between 1812 and 1844. At one time over 1,500 people worked in this area. Following the closure of the mines, many emigrated to the USA, most notably to Butte, Montana, an area also noted for mining. The poached salmon wrap and deep apple tart pie from the coffee shop are highly recommended and when enjoyed from a window seat overlooking Ballydonegan Bay, are just priceless! 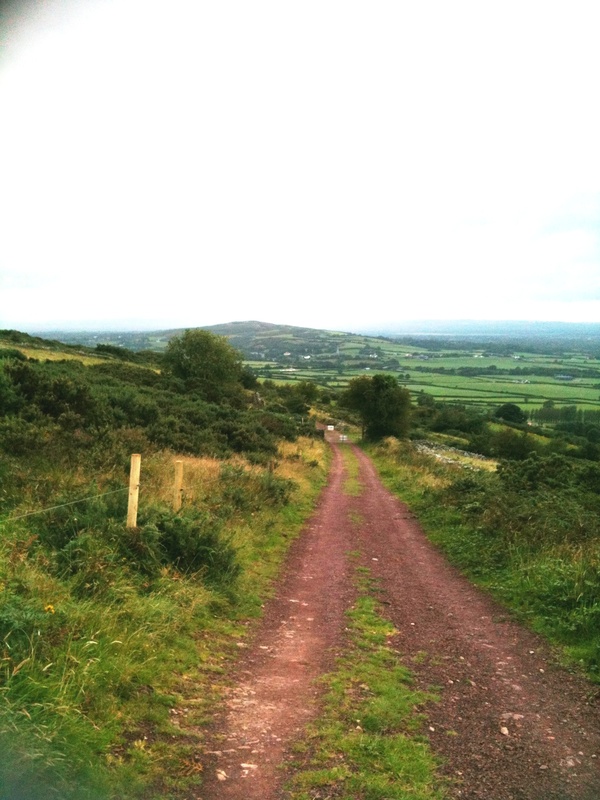 The area surrounding Allihies is rich in industrial heritage and ideal for walking. Climbing away from the village, the old Engine House, used I understand for pumping water away from the mining area underground, stands in testimony to times gone by and as a memorial to those who lost their lives during that mining period. From here the drive becomes literally breathtaking – steep climbs, sharp bends, stone walls around every corner, at the brow of every hill is a wonderful view of sheltered cottages, of geology in all its glory, of vast seascapes, of sheltered coves. The road winds down towards the edge of the land, as in this case. It is not always clear where the road actually goes! However, this road winds between the pink house and the white–washed wall and it really is difficult to keep the eyes off the wonderful scenery! Hugging the coast now, the blue-ness of the sea is astonishing. Colourfully marked sheep are more interested in their lush grass than in the spectacular views! The deep blue sea between Beara and the Ring of Kerry is spectacular indeed! The sea here is the deepest blue I have seen in a long time, reflecting the blue skies above! Further along, I get a chance to stop and look back from whence I had come – at the carefully nurtured green fields surrounding the pink house and the white-washed wall of earlier pictures. Ancient stone walls edge the roadway as another vehicle approaches. The rocky hills behind and the lovely clumps of purple heather in the foreground, behind the dry stone wall make a lovely scene. The vehicle in this picture was to be the last vehicle I would see driving on the road for the next three-quarters of an hour! I wind my way on into the picturesque village of Eyeries, with its brightly coloured street and take a few minutes to stroll along the street. The local shop looks welcoming and I get a postcard to send to Australia. Such a friendly welcome in the local shop , so I enjoy the added luxury of an ice cream while I write my postcard and mail it from the local post office! I think this house may once have been pink, or perhaps it is owned by the Pink family? 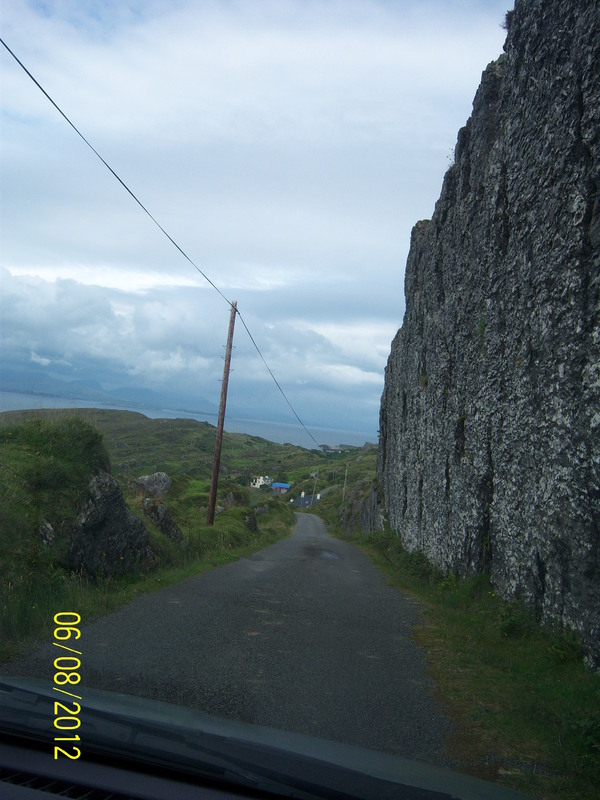 Keeping to the coast road, I came upon what was surely the most memorable place for me along the entire route of the Beara Peninsula on that day. Sun blazing from the blue sky, I notice a small ruined church perched on a corner, bounded by lovely old stone walls. Here on the bend of the road, overlooking Ardgroom harbour and bounded by a magnificent stone wall, is the ruined Kilcatherine church or abbey,possibly dating to the 7th Century. The surrounding graveyard was having its midsummer grass trim and I was fortunate in being able to see some of the detail in the graveyard where the grass had already been cut. A beautiful glimpse of the sea through the openings of the building and outside, the spectacular final resting place of the people of this area. This lonely and beautiful graveyard has a particular poignancy for me because of the large number of small grave markers intermingled with the larger headstones. 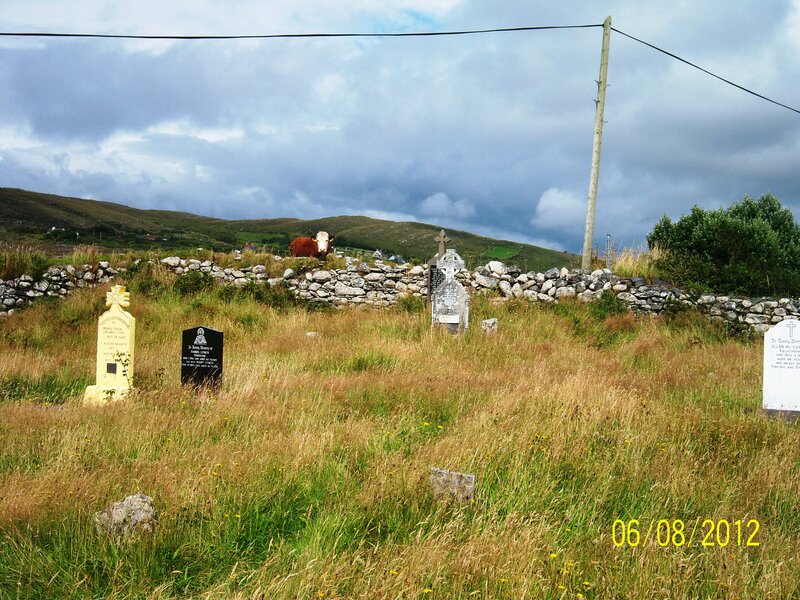 It typifies the social history of dying in Ireland – well-marked graves among the anonymous ones, or indeed no markers at all. These may be anonymous graves, but at least they are marked graves, albeit of unknown people. 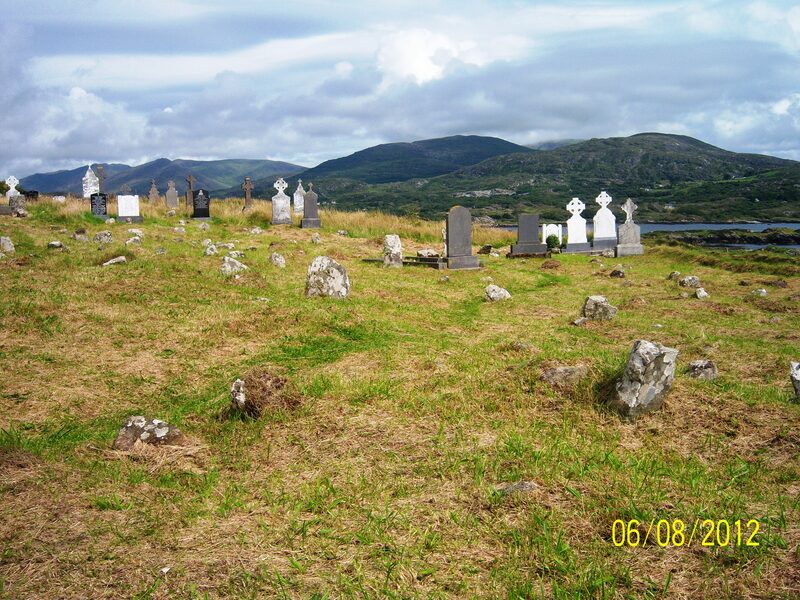 This expanse of grave markers is particularly poignant and probably represents the most memorable image of my trip around Beara. I fancy that for every marker there are many other people laid to rest without any such marker. There is much emphasis today on cataloguing named gravestones, but many of us – perhaps the majority of us- are descended from people who did not merit or could not afford to have their burial-place marked with their names. In my family, the graves of my paternal great grandparents are unmarked and unknown as are the graves of my maternal great grandparents. 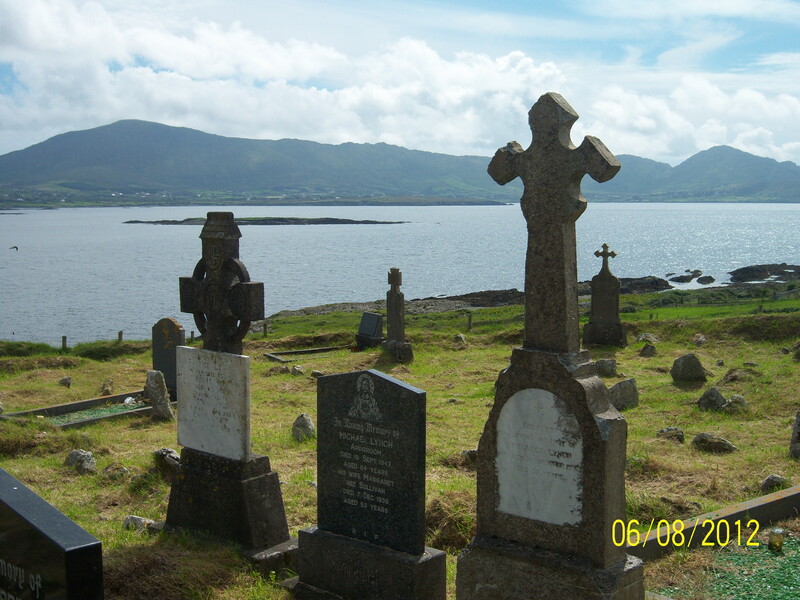 Many of us are descended from victims of the Famine and the majority of those millions are also in unmarked graves. At Kilcatherine, among the long still uncut grass, there are even more such grave markers. I have only once before seen these markers in a graveyard, and that was at Ardmore Cathedral, in County Waterford, but they may be common in Ireland. This place then to me, beautifully located in a coastal location, is a great symbol of all those who died and whose last resting place in unknown. May they all rest in peace. The Kilcatherine ruins and graveyard are enclosed by beautiful stone walls that follow the contour of the road. 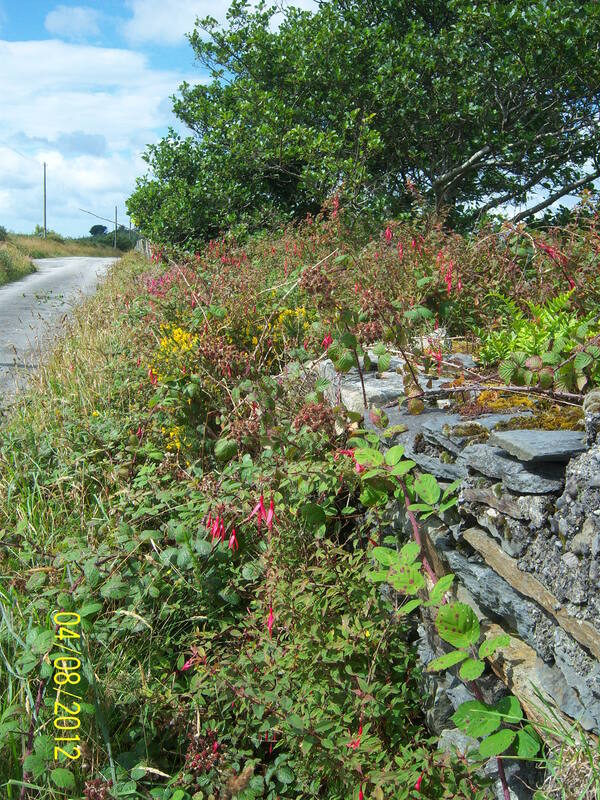 Dry stone walls are a fascinating part of the heritage of Ireland, and are a particular passion of this writer .. meriting a post all by themselves soon! And so onward, where the road less travelled gets even narrower as this picture shows. The views continue to amaze and the landscape begins to change to one of country lanes with no traffic at all. 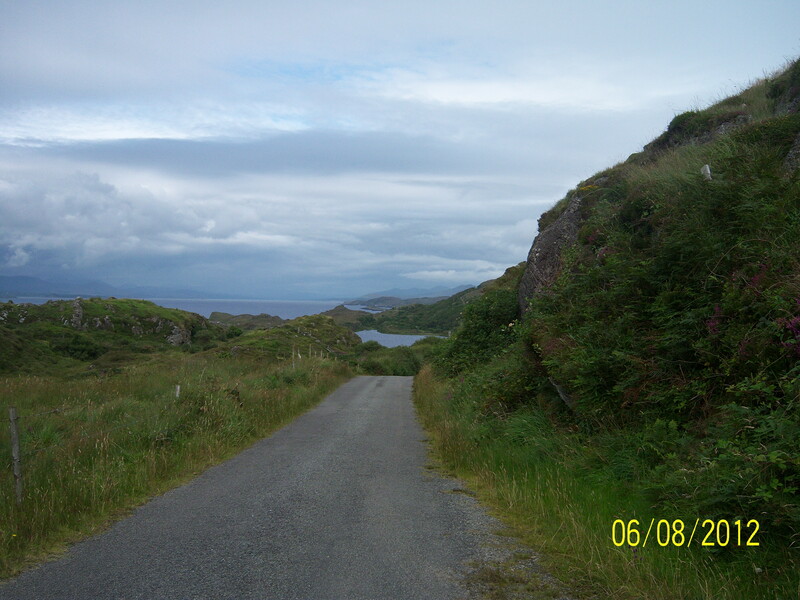 The road is twisty and very narrow now, but with great views of Kenmare Bay at every turn. 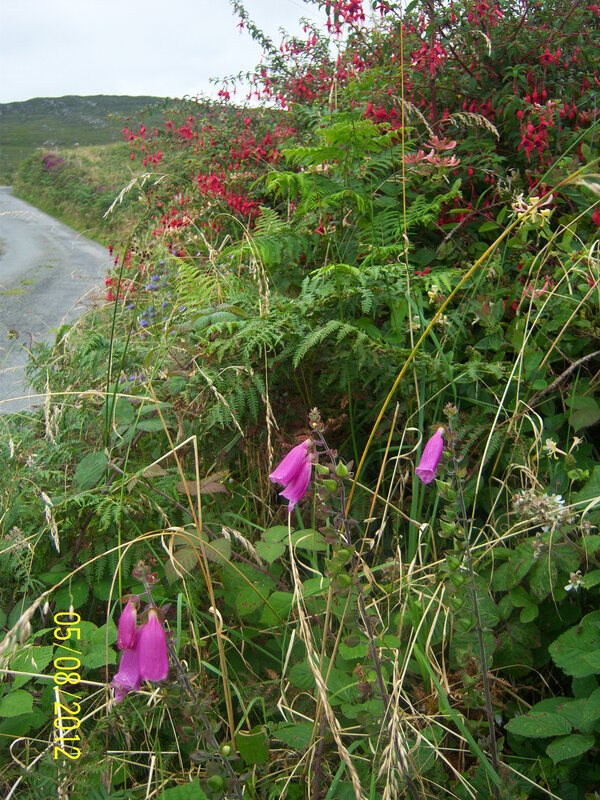 I am almost at the end, and in a little while I am surrounded by the fabulous Fuchsia hedging that flourishes along the Atlantic seaboard but especially in this part of Ireland. The red blossoms are full of nectar and the bees hum noisily among the beautiful flowers. 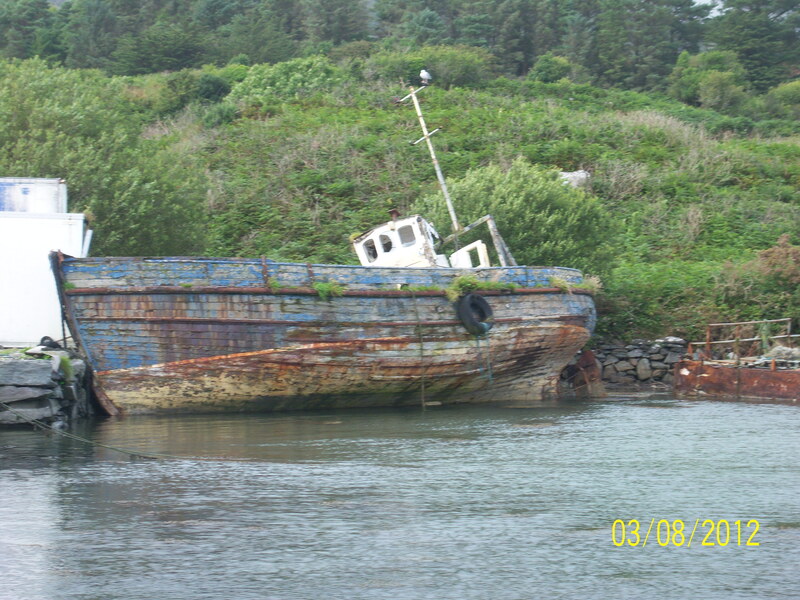 A truly lovely image to end my serendipitous tour of the Beara Peninsula. Béidh mé arais arís! I hope you enjoy looking at my ‘snaps’ and that they may entice you to visit this remote but wonderful gem in the south-west of Ireland! I committed myself and my vehicle to the capable hands of Murphy’s Ferries to make the short crossing to Bere Island. I cautiously looked around for the lifeboats. None! 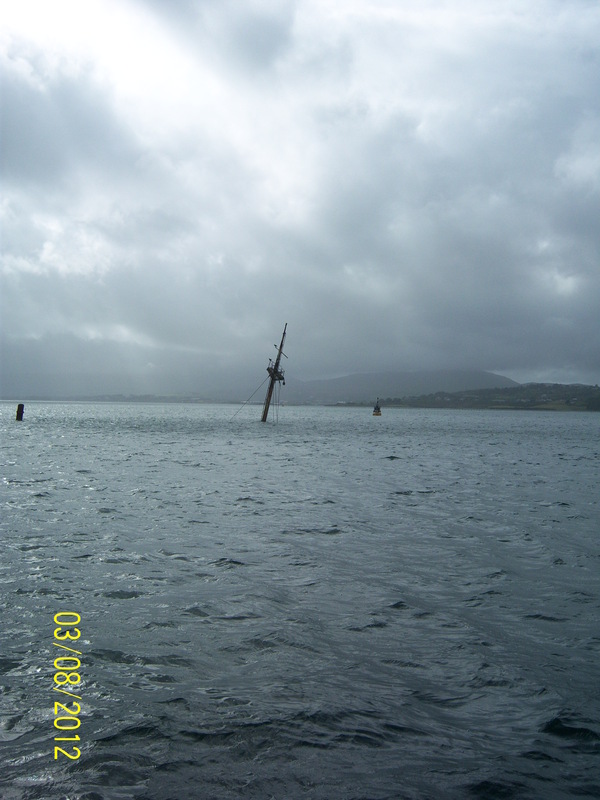 OK. if my time is up, it is up and I will sink into beautiful Bantry Bay, the deepest natural harbour in Europe!There was a brief heart-stopping moment when, about 2/3rd of the way across, I saw what appeared to be a mast and a funnel poking out of the water. Could this have been a ferry? No –too big! A bigger REAL ship perhaps? It turned out to be the wreck of the M.V Bardini Reefer, a Panamanian Factory Fishing Vessel, that on 15 December 1982 caught fire and sank! However, our trusty ferry arrived safe and sound, as it always does, and soon I was enjoying negotiating the narrow, high hedged roads and laneways of Bere Island. The Admiral’s House did not disappoint with its imposing views of Bantry bay and the mainland. 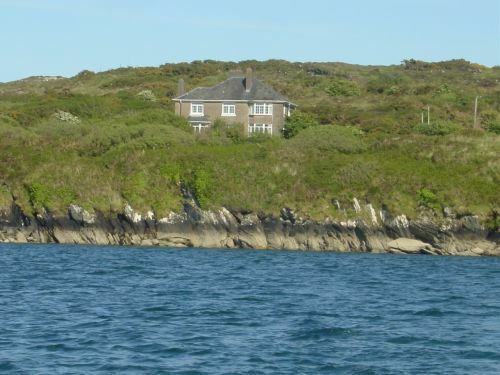 An image of the Admiral’s House from The Admiral’s House webpage! 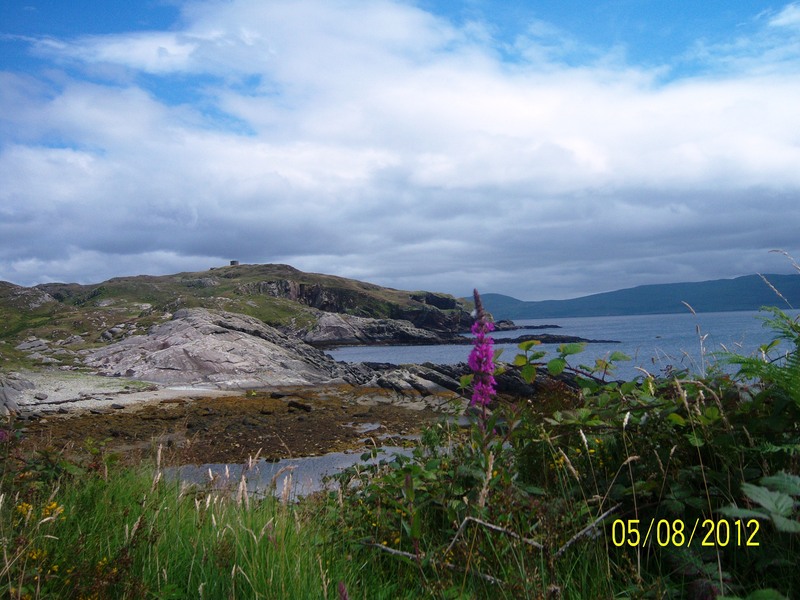 And so began a few days of discovery – spectacular views; gorgeous lanes edged by beautiful linear meadows and hedgerows; loud silence in marked contrast to military emplacements that once guarded the entrance to Bantry Bay. Bere is a place for walkers. Suitably clad to deal with changes in temperature and sudden heavy short-lived showers, we headed off on the Rerrin Loop. 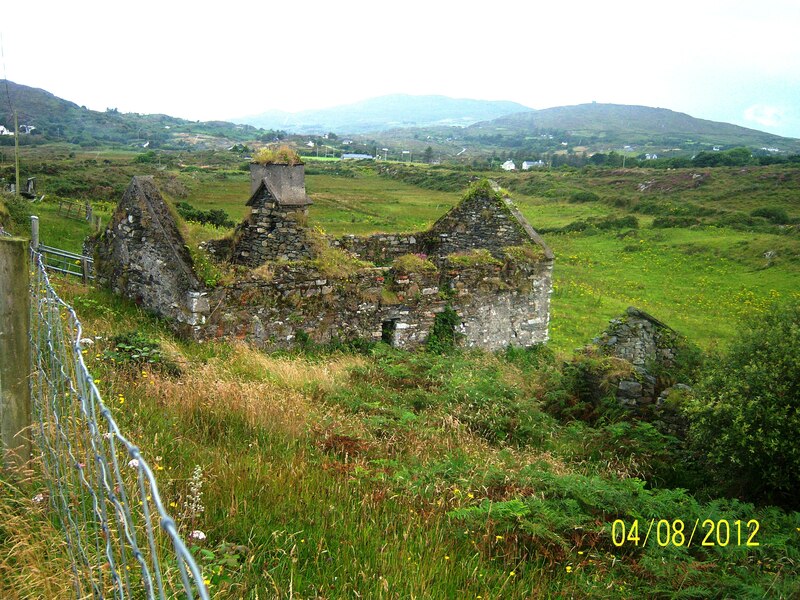 Rerrin, the small village is at the eastern end of the island, where the Irish Army still has a presence. 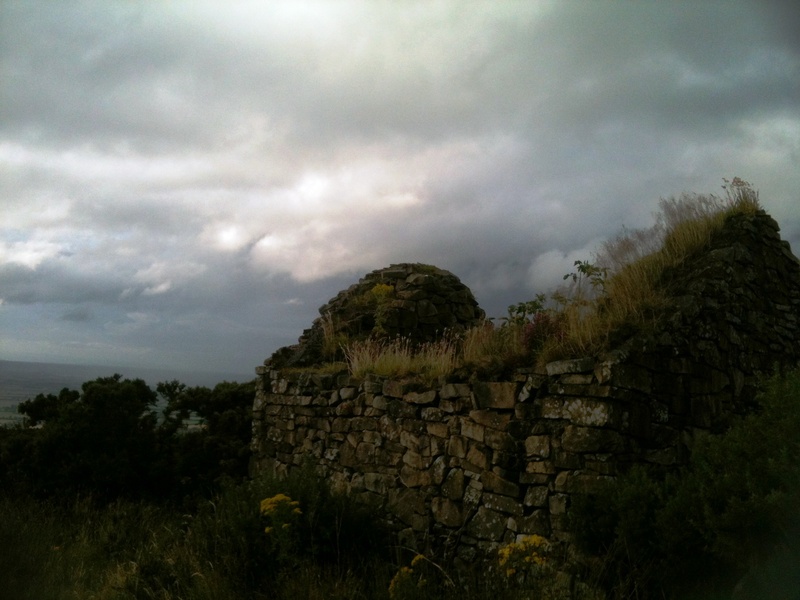 At the eastern end of the island stands an impressive gun emplacement, guarded by a deep moat and kept mown by a herd of goats who share this place with a couple of colonies of bats. It is hoped that eventually this spot can be developed into a unique tourist attraction. 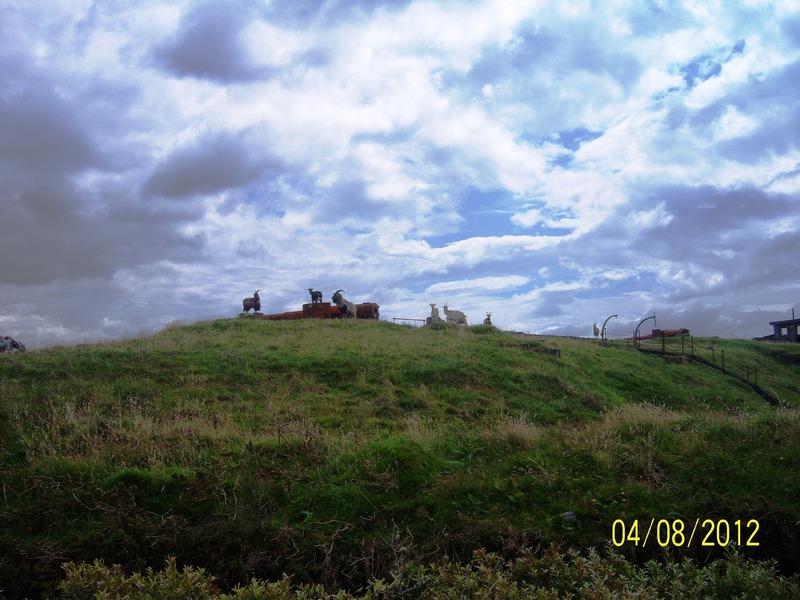 Goats guard gun emplacements at Lonehort Battery (above). 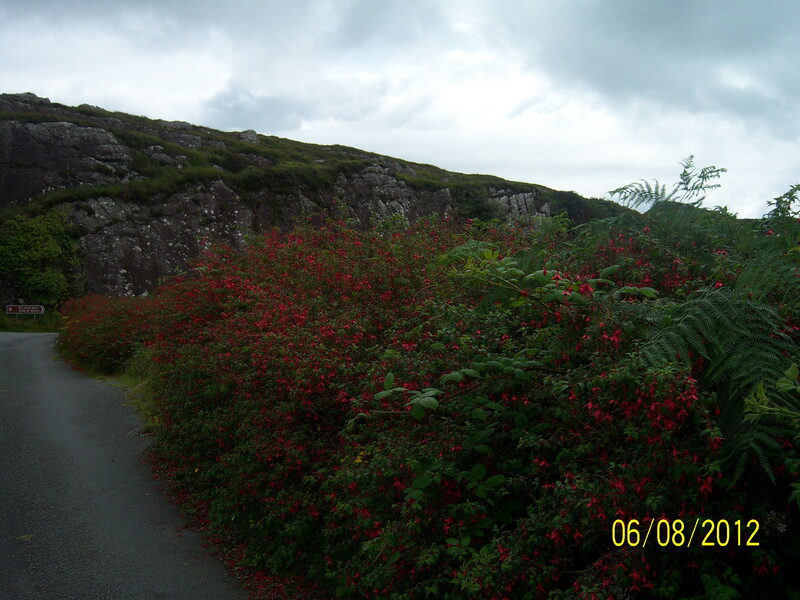 The hedgerows of Bere island are beautiful, untouched by pollution and with many species growing alongside one another. 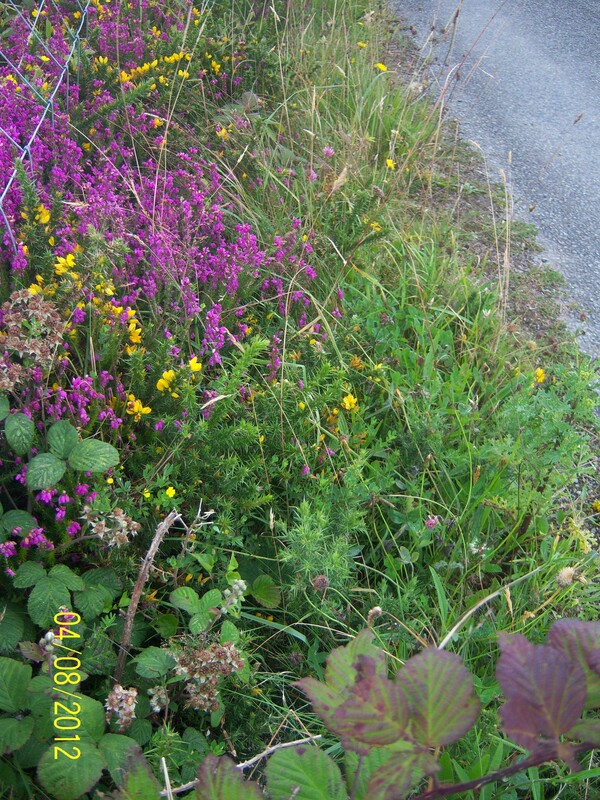 Fuchsia, gorse, heather, digitalis, honeysuckle, meadow-sweet among others, mingle together. 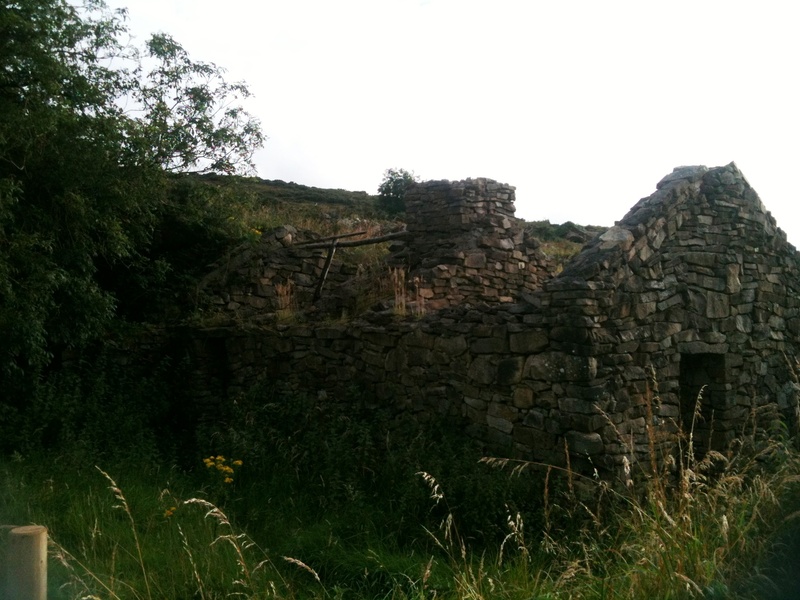 Another noticeable feature of the island is the number of ruined and abandoned stone cottages . Abandoned perhaps because of migration, death or for an upgrade to more modern conditions. Whatever the reason, they leave an indelible mark on the landscape of places that perhaps once resounded with the sounds of children playing and laughing, but are now in deep silence. Once a home. Some cottages have signs of once having had gardens and flowers surrounding them. This hydrangea is now almost as high as the cottage itself and stands in enduring tribute to the person who planted it many years ago. 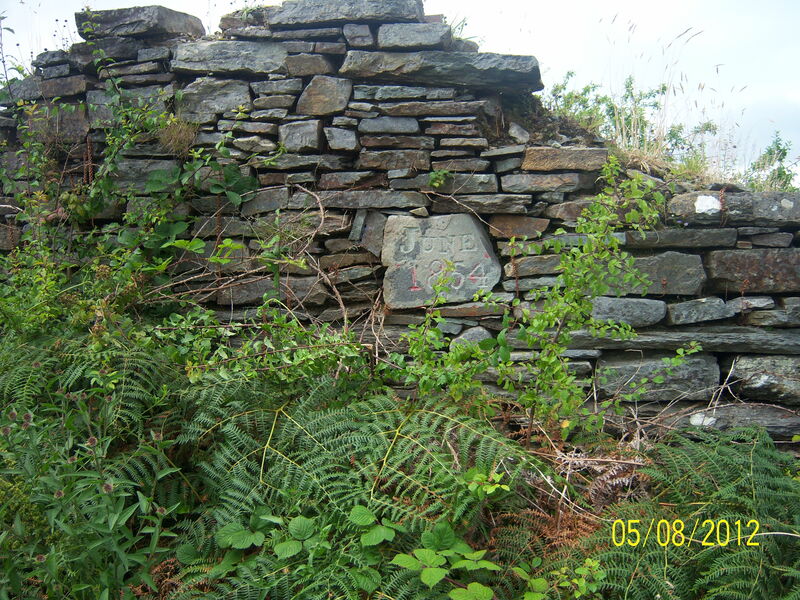 This cottage, on the roadside has an intriguing stone set into the wall engraved with the date June 1854 – it would be fascinating to discover the significance of this date to the people who lived here once upon a time. 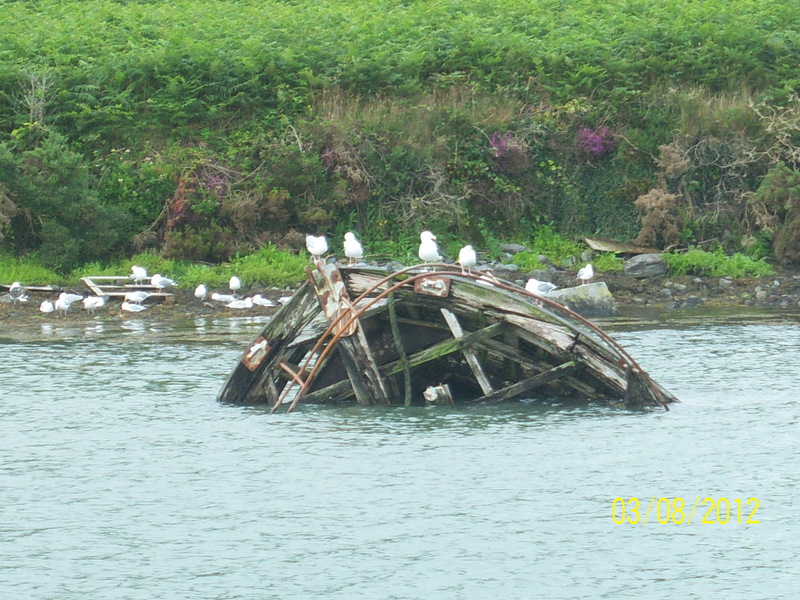 Bere Island has a rich heritage. Vikings, French and British have landed here and the island monuments reflect this varied history. 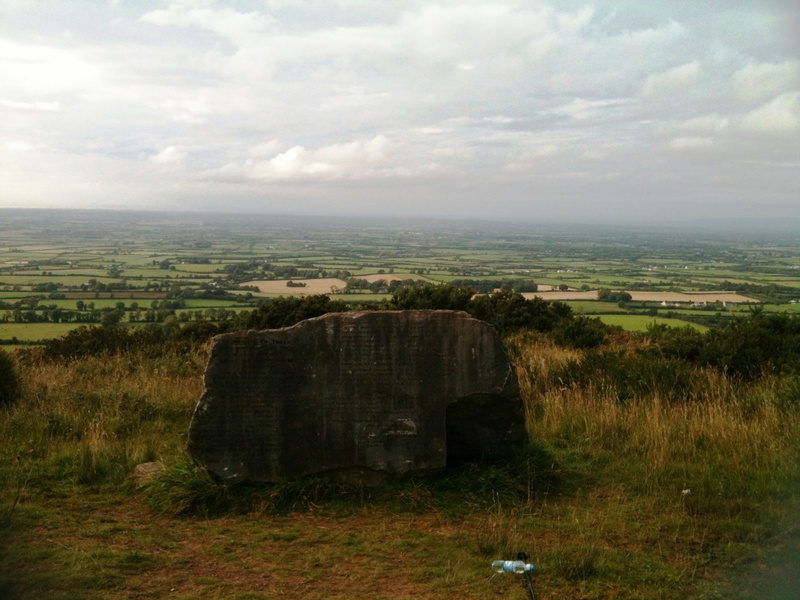 Among the older monuments is the Standing Stone (below) dating from at least a millennium BC . This impressive stone stands at the very centre of the island. For the less energetic, there are other fascinating and beautiful walks all over the island with the wonders of nature all around. Bere is a place of extraordinary beauty, a place of great peace – far from the hustle, bustle and humdrum of every day life. As I departed on my ferry after a few days, I earnestly wish to pay a return visit to discover even more of this place that is truly a place apart. Across from a television set with the obsolete girth of a model bought 20 years ago, beneath the grandchildren’s crayon artwork taped to the wall, to the left of an abandoned hula hoop, Charles F. Feeney sits in an armchair and explains how he will get rid of his last $1.5 billion, give or take, by 2016. Charles F. Feeney, 81, has already given away $6 billion through his foundations.Just as he did with his first $6 billion, it will all be awarded through Atlantic Philanthropies, the group of private foundations he created in 1982 and managed to run anonymously for its first 15 years, even though it was one of the largest sources of grants in the United States, Ireland, South Africa and Vietnam. Why shut it down? Mr. Feeney, 81, a man with no romantic attachment to wealth or its trappings, said the world had enough urgent problems that required attention now, before they became even more expensive to solve. By its end, Atlantic will have invested about $7.5 billion in direct medical care,immigration reform, education, criminal justice advocacy and peace-building initiatives. It was an invisible hand at the end of armed conflicts in South Africa and in Northern Ireland, providing funds to buttress constitutional politics over paramilitary action. It has supported marriage-equality campaigns, death penalty opponents and contributed $25 million to push health care reform. Last fall, Mr. Feeney gave his alma mater, Cornell University, $350 million to seal its bid to build a new campus for advanced engineering that New York City has commissioned for Roosevelt Island. The day the gift was announced, Stanford University dropped out of the competition. He has also given $270 million for a new medical campus in San Francisco. “If only I could remember who hooked me up with it,” Mr. Feeney said. “He said, ‘You’re out here a lot anyway, it won’t take much of your time.’ ” That was in 2004. With grand philanthropy often comes public glory for wealthy donors, as buildings and institutes are dedicated to benefactors, their names embedded above doorways like graffiti tags chiseled in marble. No building anywhere bears Mr. Feeney’s name. Among tycoons, he has been a countercultural figure of rare force, clinging to his privacy far more fiercely than to his money. He set up the philanthropies in Bermuda, in large part because that would allow him to escape United States disclosure requirements. That also meant he could not take tax deductions when he contributed his holdings. Mr. Feeney, who grew up in a working-class family in Elizabeth, N.J., served as a radio operator in the United States Air Force and attended Cornell on the G.I. Bill. He sold liquor to sailors in ports, then formed a company that ran airport duty-free shops around the world. He secretly turned over the duty-free business to the philanthropies in 1984 and continued to invest. In 1997, he disclosed his role in Atlantic when the business was being sold, but stayed out of public sight. In the last 10 years, he decided that enlarging his profile might inspire rich people to share their fortunes. One result was “The Billionaire Who Wasn’t,” a sparkling, unblinking biography by Conor O’Clery, a leading Irish journalist. Another was that Warren Buffett called Mr. Feeney the “spiritual leader” of a campaign urging extremely wealthy people to donate their money. When in New York, Mr. Feeney lives in a building on a side street in Midtown Manhattan, preferring to bob in the anonymous streams of a crowded sidewalk to being swaddled in the liveried privacy he could easily have bought on Park or Fifth Avenue. 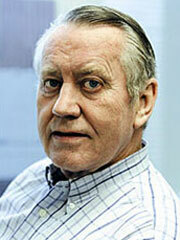 Charles Feeney was born to a working class family in New Jersey, USA in the early 1930′s. His father’s mother hailed from near Kinawley, in Co Fermanagh, from where she emigrated to the USA. In the 1960′s he co-founded Duty Free Shoppers, which sold luxury goods ‘duty free’ in Honolulu and Hong Kong and which eventually became hugely successful, making the partners very wealthy. DFS was to become one of the largest liquor retailers in the world and in 1997, Feeney sold his interest to Louis Vuitton Moët Hennessy (LVMH). In 1988, the Forbes Rich List ranked Feeney in the top 20 richest people, with estimated wealth of €1.3billion. But, in reality his wealth was much less as he had in 1982 transferred much of it – reportedly between $500 million and $800 million – to a charitable foundation, The Atlantic Foundation. Based in Bermuda to avoid disclosure requirements in the USA and to give Charles Feeney the anonymity he craved, The Atlantic Foundation was the first of The Atlantic Philanthropies. A very private and modest man, the story of Charles (Chuck) Feeney was not well known until the 1990s when in an interview with The New York Times he revealed that he was the benefactor of one of the top 5 philanthropic foundations in the world. It was not until 2007 when Conor O’ Cleary, a well respected correspondent of The Irish Times, published a book : The Billionaire Who Wasn’t: How Chuck Feeney Secretly Made and Gave Away a Fortune, that the truth about Feeney became known. (Feeney had decided to cooperate with the author to promote ‘Giving While Living’ and inspire wealthy people to donate their wealth during their lifetime). Also in 1997 RTE, the Irish television service, aired a TV documentary, ‘The Secret Billionaire’ looking at the life of this extraordinary man. Charles ‘Chuck’ Feeney does not own on a house, he does not own a car and his $15 plastic watch is now famous! He lives modestly, having said that a man can only wear one pair of shoes at a time. He has never strayed far from the sense of community he was born into – one of helping his neighbour, and he has the ability to empathize with people less fortunate than himself who lead difficult lives and who may not have enough to eat. And so this week, the week of St Patrick’s Day, will see Charles ‘Chuck’ Feeney, extraordinary Irish American, inducted into the Irish America Hall of Fame. There is no doubt but that his benevolence has had a huge impact on life and society in Ireland, and continues to do so through funding for social issues from The Atlantic Philanthropies, including fighting ageism, of particular interest to this blogger. The website of The Atlantic Philanthropies can be viewed here. For more on the Irish American Hall of Fame click here.